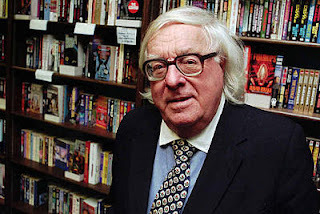 Ray Bradbury is a wacky Old Guy. Really. I mean that in the most splendid, affectionate way of course. I love Science Fiction and Martian Chronicles was my first real introduction to what Science Fiction could be. In 2004 Bradbury received a Medal of Arts from the NEA who, as part of a project called 'The Big Read', interviewed him at his home in all his wacky Old Guy glory. They discuss Fahrenheit 451 and his illustrious career. Our Current Future Past never looked or sounded so good! God, wasn't Martian Chronicles sooo intelligent. I still remember that, even though I read it while I was still innocent.